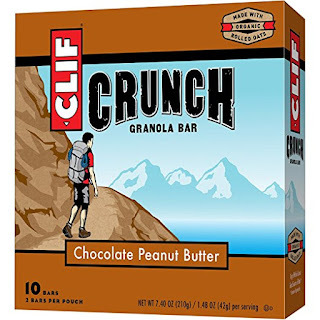 If your snagging something from Amazon today over $25 - I came across these CLIF CRUNCH - Granola Bar - Chocolate Peanut Butter - 1.48 Ounce, 5 Two-Bar Pouches ONLY $2.88 (Retail $5) - which my son LOVES. -Mix peanut butter chips, chocolate chips and whole grain oats together and what do you get? Snacking deliciousness. -Less than 200 calories per serving for a delicious on-the-go snack. -Crafted with Organic Rolled Oats and Organic Barley and Rye flakes, CLIF CRUNCH(r) is a good source of fiber (contains 9g total fat).